What are Your Favorite Airplane Snacks? It's no secret that airline food isn't particularly kid friendly, and lately most flights don't include any food at all, leaving parents to bring along their own snacks and meals for their hungry kids. Recently The Perrin Post asked parents for their favorite travel snacks and there were some great ideas, but of course I'd love to hear what you think. There is an art-form to packing snacks to bring along on an plane ride. They need need to last un-refrigerated for hours, cannot contain liquid, and preferably they take no space at all, are filling, and not sugar laden. If you care about being considerate to fellow passengers, your carry-on meal shouldn't include peanuts or be too smelly either. And now the EPA says it is unsafe to add hot or cold airplane drinking water to a snack like oatmeal or ramen noodles. That's a tall order for any parent, especially when you are packing up to leave town, or returning from a long vacation. 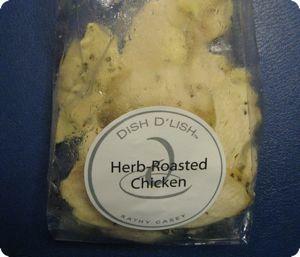 I'm willing to bet that my readers have some more creative ideas... What are your favorite Airplane Snacks? Alicia on September 3, 2008 at 9:33 a.m.
of course, most of this stuff had to be eaten fairly quickly after we got on the plane. (ie, within a couple of hours) I also recommend a place mat so if something spills on the tray, it wont come in contact with the germs. fruit and cheese plates are also fairly easy to find in airport restaurants. Meg on September 3, 2008 at 4:37 p.m.
On our last trip, the insulated bag was left in the fridge, but thankfully it was an international flight with great service. We did learn you can always buy a cup of milk from a coffee kiosk at the airport. Debbie on September 3, 2008 at 9:34 p.m.
@alicia Great suggestions! A fun tip for raisins (and other small foods) is to challenge your child to pick up and eat only one at a time. It's great for their small motor skills and slows them down so they stay busy longer! @meg good tip about the dried fruit. we have those green bean chips at our market, and my son loves them, I wonder why I've never though to travel with them. Amanda @ www.kiddio.org on September 4, 2008 at 1:23 p.m. I've flown quite a bit with my kids, and usually sans-husband so I look for snacks that (a) I don't have to explain to security, (b) have protein rather than sugar, and (c) are somehow fun. Everyone else has shared good ideas, and to these I would add trail mix. It's fun to sort it into piles, talk about how many of each kind of thing there is, what our favorite part is, etc. Sometimes we'll play games and use the pieces as rewards for the right answer (like twenty questions and the winner gets a raisin or m&m. We also like the babybel cheeses since you can sculpt the wax that it comes wrapped in. codeCrafter on September 4, 2008 at 2:14 p.m.
* All sorts of stuff from Just Tomatoes http://www.justtomatoes.com/ They have a large variety of dry fruit and veggies. My son loves the corn. * Cereal - Cherrios are a favorite. * Instant oatmeal packets - you can get hot water on planes usually for tea. You can also get ice to help cool it down quick. * Crackers - goldfish crackers are a favorite. * Cheese curds or string cheese. * fruit leathers/roll-ups - these are pretty easy to make yourself. Stacy on September 5, 2008 at 8:50 p.m. I also pack a small cooler and get ice for it after we pass through security. Ditto on the noodles and string cheese. One of my kids' favorites for trips is edamame. I buy the frozen pods, heat them, and take the beans out. Mara on September 9, 2008 at 6:35 p.m.
Hmmm. I don't think I'm always as healthy as everyone here. I do always have dried fruit (a stand-by in my family). One thing I like to do is stroll through the aisles of my local co-op and pick up things that we don't usually have to make the trip special. Last time I ended up with polenta chips, juice and milk boxes, gummy worms (flavored with fruit juice), chocolate-covered pretzels (very messy, I won't do that again), granola bars, and apples. I definitely wish I had packed some sandwiches, as our flight was on Air India and the kids were not interested in the food at all. Can I confess here that I went through a period when I was traveling for a year with my toddler when I packed cut- up hot dog? He loved it. Wendy on June 18, 2009 at 4:05 p.m. I love trailmix, but in addition to being fattening, can make kids (and I)gassy. Not good if you are trying to wrangle more than one of them on a long trip. I have taken along small packages of oreos, and things like bagel chips, or peanut butter stuffed pretzels. These I can eat in smaller amounts. I like the idea of the small cheeses, will definitely try that next time. I am trying to think of a way to pack a sandwich that wont spoil on the trip over...Maybe a whole wheat bagel w/ cream cheese and deli meat that has been previously frozen? Who could tell me if they had tried that before? Mom of all boys on August 2, 2009 at 12:36 a.m.
Love all the ideas, thanks! So can you take the prepackaged milk and juiceboxes through security? Debbie on August 2, 2009 at 7:20 a.m.
No, unfortunately you cannot take prepackeged milk (except baby formula) or juice boxes through security. I think that some of the commenters were sharing ideas that they used for road trips. Most major US airports have a Starbucks inside of the secure area, and they generally sell shelf stable milk and juice boxes that you can buy and take onboard. Melissa on September 25, 2009 at 9:20 a.m.
Angie on April 21, 2010 at 7:20 a.m.
Julie on February 28, 2012 at 2:54 p.m. I've taken whole milk (I froze it the night before) through security in a sippy cup...all they said to me was they had to test it. This was in Fort Lauderdale, Nashville and O'Hare. As far as healthier snack options, there are always Annie's fruit snacks, cheddar bunnies and graham bunnies...those are a perfect size for younger toddlers. I love the fruit cup idea! Kristy on May 7, 2015 at 12:33 p.m. Thank you everyone for the great ideas, traveling with my 4yr old, 1st time on an airplane so nervous as to how she handles the pressure change. Definetly gonna get the Annies graham bunnies.